Melissa is a Level 1 Coach and spent her early coaching career teaching at Lancers. 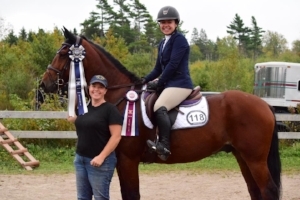 Melissa left Lancers to obtain a Bachelor of Education and eventually moved to England where she was a barn manager and instructor for seven years. She managed and taught at a stable that had 80 horses, 40 of which were school horses. Melissa returned to Canada a few years ago and we are thrilled that she is back teaching at Lancers. After many years out of the saddle, Pat came to Lancers as an adult rider and rode here for ten years. She joined Lancers as an instructor in the past few years. 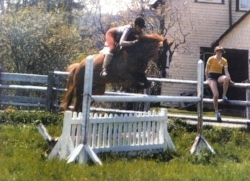 She achieved her Level 1 Coaching certificate in 1978 when she was actively involved with the Canadian Pony Club. She was an instructor at both the Rothesay and the Fredericton Pony Clubs. 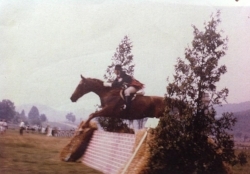 As a junior rider, Pat competed in horse shows and three National Pony Club Rallies and she achieved an A level, the highest level that Pony Club awarded. She also competed in eventing up to preliminary level, which includes dressage, cross-country and stadium jumping. Pat teaches adults on Thursday evenings and her riders always appreciate her encouraging teaching style. What do you think makes Lancers unique? How does Lancers compare or contrast to other barns you have worked/taught at? Belinda is a Level 1 Coach and rode at Lancers in the 1990s and early 2000s. 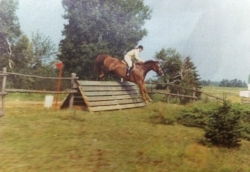 As a rider, she showed in the hunter and jumper ring in Nova Scotia and through her participation in Pony Club, she had the opportunity to compete in Quebec and South Africa. Belinda particularly enjoyed medal classes; the CEF medal was her favourite class. Her love of coaching led her to her current career in education. Having a school teacher who is accustomed to working with youth is a great asset to Lancers. Belinda is particularly happy to be back at Lancers after a number of years away. Working with riders who are passionate and want to learn has reignited her passion for education. When not teaching at school or Lancers, Belinda also teaches the Equine Theory course for individuals looking to earn their instructor certification and she is also an evaluator for the Learn to Ride rider level program for Equine Canada. Charlotte has been riding at Lancers since 2001 and recently joined the team as an NCCP certified instructor. Charlotte has been riding since 1999 (at Briarwood and Pine Hill) and started at Lancers in 2001. While also riding at Lancers, she has competed in on and off-property shows around the province. Her show experience also extends to the very important and skilled role of groom. She worked as a groom for Evan Phinney for twelve summers and even accompanied her to the Royal West in Calgary. After a year in British Columbia, Charlotte returned to Halifax as was keen to return to Lancers. She was enrolled in lessons at Lancers before she was enrolled in university classes for that fall! She noted, “Since then, I’ve pretty much lived and breathed Lancers. Distance made my heart grow fonder”. A self-proclaimed stickler, Charlotte expects her riders and horses to be well turned out with clean tack, tidy tucked-in shirts with belts, horses that are groomed to a shine with no shavings in manes and tails and hooves that are free of dirt and debris. This is important, Charlotte explains, because it not only shows good horsemanship but it shows respect for your coach, the horse, and Lancers as an institution. Claire is an NCCP certified instructor and teaches both youth and adult lessons on Monday evenings. Claire is another Lancer instructor who began riding in the Lancer Junior Beginner Course in 2007. She takes the sport very seriously and began competing at a young age. She has competed in both the hunter and jumper ring and aspires to do more in the jumpers. Over the years she has become a familiar face around the barn. In addition to riding three times a week, and prior to becoming an instructor, Claire spent two years as a barn monitor and this year was a full-time summer camp counsellor. She was in the Musical Ride for the past four years and is the current Vice-President of the Lancer Junior Executive. When she began her role as a Lancer instructor, teaching came quite easily to her as Claire possesses some wonderful leadership skills. For Claire, it is the incredible range and versatility that makes Lancers unique – from beginner courses to showing opportunities, clinics, and fun weekends, you can be with Lancers from age eight, right into adulthood. After riding at Lancers for the past eight years, Caroline has now joined Lancers as an NCCP certified instructor. In 2017, she also held the full-time role of March Break Camp and Summer Camp counsellor. Caroline began riding in 2009 and has spent the entirety of her riding career at Lancers but has also had the privilege for owning her own horse, Jakey. After getting a start in the show ring on Lancer ponies, she now competes with Jakey in the jumper ring with numerous championships in the 1.15 division. In addition to competing, Caroline has been the leader of our Musical Ride for the past two years. Caroline teaches some of our youngest riders who benefit greatly from her kind and patient teaching style. According to Caroline, she is happiest teaching beginners because she loves “seeing them fall in love with horses and the sport”.